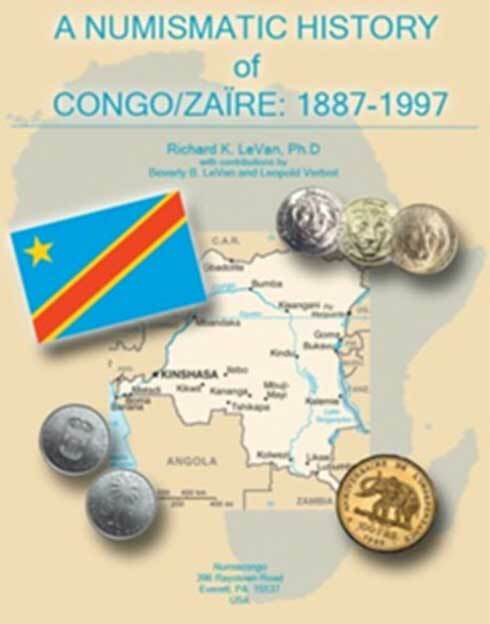 THIS book addresses the coinage of Congo/Zaïre. It sets the coins in their historical context as it moves in chronological fashion from the first silver and copper coins authorized by the Belgian King, Leopold II in 1887, for the Congo Free State (L’État indépendant du Congo) through the last silver and gold proof coins authorized by Joseph Mobutu in his final turbulent years as the President of Zaïre (1996-1997). THIS chronicle, the first in English to provide a systematic discussion of this area of numismatic interest, will prove a valuable resource for collectors, coin dealers and auction houses, as well as those with an interest in African studies and history in general. It contains hundreds of pictures as well as specifications (size, weight, mintage figures, etc) for about every coin ever minted for Congo/Zaïre. Many essai/pattern coins as well as coins with notable strike anomalies, such as date over-strikes are also included. IDENTIFYING reference numbers for the coins are drawn primarily from the cataloging work of: Charles Dupriez (1949) and Léon Bogaert (1972), as well as Louis Ciani and Krause Mishler Publications. The author has added a number of attributions for coins not previously listed, or clearly delineated. Where attributions have been added, they are “built” primarily on the numbering system of Dupriez. IN the period from 1887-1997, the Congo went through a metamorphosis. Initially the nation was ruled for some 23 years (commencing in 1885) by a foreign King, who imprinted his image on the first coin designs for the Congo Free State. As absolute ruler of the Congo Free State, Belgian King Leopold II’s image was front and center on all the silver coinage of the period (1887-1896). Subsequently, renamed the Belgian Congo, and henceforth administered by the Belgian government, the coin designs for the colony would for decades, continue to portray Belgian heads-of-state, Albert II and then Leopold III, as the centerpiece. THE Congo’s coinage by the 1940’s, finally began to reflect fauna of the country – elephants, with no reference to Belgian heads-of-state. In 1965 the newly independent Congo’s first circulation coinage was released, featuring a lion design. Katanga’s earlier experiment with independence (1961) produced the 1 and 5 franc pieces that included bananas and copper crosses in their design – with no portrait of a government official. PORTRAITS of heads-of-state, so common in European coin designs, by 1965 were once again utilized on coins in the Congo. This time, however, it was Congo’s first President, Joseph Kasa-Vubu that would grace a gold 5-piece Independence Anniversary Set. Subsequently, after Mobutu came to power, his portrait would anchor the obverse of Congo’s coinage from 1967-1988, reflecting his central role in, and absolute control over the Congo’s affairs. As it would turn out, this one-hundred-ten year period (1887-1997) would end as it had began, with supreme rulers, first Leopold II and then Mobutu, stepping (or forced as the case may be) aside as cries for economic and societal reforms rang aloud both in and outside the Congo. Thus the Congo’s coinage is a lasting and tangible testament to the historic and economic realities, of both the Congo itself and the nations with which it interacted . . .
FORTUNATELY, for those who collect and study African coinage, this hundred-ten year period of the Congo’s development offers a wealth of opportunity. Hopefully, armed with an understanding of the cultural context and significance of these pieces, all of our collecting experiences will be enhanced, and consequently made more productive, enjoyable and fulfilling. If you collect World Coins, this profusely illustrated volume would make a very informative addition to your library!